It's easy to decide whether or not to build a deck. They increase home value and add a fun outdoor area to any home. The hard part is deciding what to make it with. If you are not sure which type of decking is right for your project, we can help. We created a list of the most popular deck materials along with information on their benefits, disadvantages, costs, and care with the goal of making it easier to find the right material to fit your needs and budget. 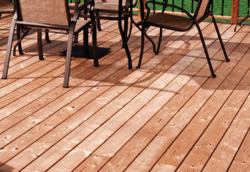 Pressure treated lumber is the most common decking material currently used. It is wood, often pine, that has been treated with chemicals to repel insects and moisture. This treatment process makes the wood better suited for a wide variety of applications. Pressure treated lumber is the least expensive type of decking. It is readily available and easy to fasten with nails or screws. It can be finished with a clear sealant which, if maintained properly, allows it to last for decades (or more). Decks made with pressure treated lumber can last many years, but require a lot of maintenance to do so. They require yearly washing, staining, and sealing to protect against cracking, splitting, and warping. However, even if routine maintenance is performed, these boards are susceptible to shrinking and drying out over time (especially in harsh climates). Wood splinters are also a common concern. Why use pressure treated decking? Pressure treated wood decking is the best option for individuals that want a sturdy deck with minimal upfront costs. However, if you are disinclined to maintain a steady maintenance routine, plan on growing into your space over time, or live in a harsh climate with large seasonal weather changes it might be best to look at alternative materials. Due to the chemicals used on pressure treated wood, it is also a good idea to consider whether there will be children and/or pets that may come in direct contact with the deck. If so, be sure to take any necessary precautions. Cedar is a reddish-brown softwood that is widely used in the building industry. It is a naturally resilient and features tonal properties that create a distinct look when compared to other species of wood. Cedar is renowned for its rich color and beautiful appearance. It is a decking option that is loved for being natural, sustainable, and durable without needing any chemicals or preservatives. Cedar also contains tannins and oils that make it resistant to rot, decay, and insects. Like all wood, cedar requires some maintenance to maintain its beauty. This means that a cedar deck will require a power washing annually and re-finishing every three to four years. The wood will also need to be stained in order to maintain its natural color. If not regularly stained, cedar will become weathered and fade to a soft silvery gray color. Cedar decking is a great option for those who prefer the natural look of real wood. However, like pressure treated lumber, it requires an ongoing commitment of time and money for upkeep. Cedar is typically more expensive than pressure treated lumber, but is all natural and will last many years with proper care. 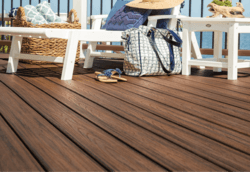 PVC decking is a synthetic option with a solid Poly Vinyl Chloride core wrapped in a thermoplastic resin for exceptional stain and fade resistance. PVC decking requires ultra-low maintenance. PVC contains zero organics to absorb water making it ideal for high moisture environments. 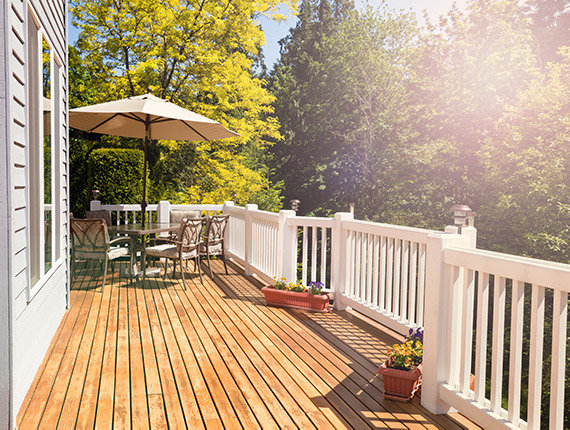 For this reason, PVC comes with the longest warranties of all man-made decking products. 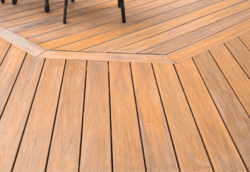 This decking will maintain its color for long-lasting beauty and never need staining or sealing. PVC Decking is lightweight with a very high level of work-ability making it the preferred product for many professional deck builders. PVC is often sold at a higher price point when compared to other synthetic decking options. Although it can be recycled, the material does not contain post-consumer recycled materials like some composite products. PVC is also prone to expand and contract in length with changes in temperature and requires special attention to installation guidelines for best performance. 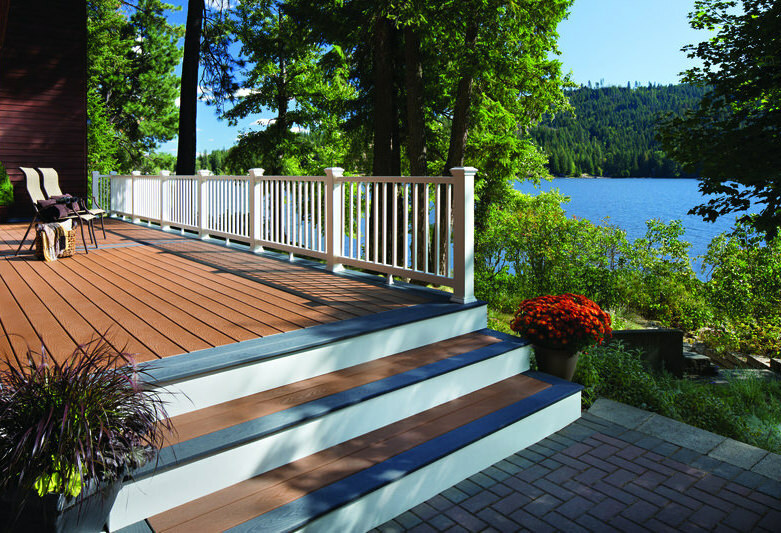 Although typically more expensive up-front than wood, PVC decking is perfect for homeowners who want ultra-low maintenance and the aesthetics to be the envy of the neighborhood. Composite is a man-made product comprised of recycled wood fibers and polyethylene. It comes in a variety of colors and is engineered to have an appearance that is comparable to wood. Made with recycled materials like wood waste and plastic sacks, composite decking requires minimal maintenance, doesn't need to be sanded or painted and is generally weather-resistant. It also comes in a variety of colors and styles. Composite deck boards are the most expensive decking option. Also, some composite deck materials can get slippery and be prone to mildew. Depending on the product, special fasteners may be required for installation. Although composite decks can carry a hefty price tag, they deliver the best characteristics of both wood and PVC. Composite boards feature the beautiful look of wood and never need painting, staining, or refinishing. If you want a high-quality deck you can grow into that will age gracefully and require very little maintenance, composite materials are recommended. Once you know what you are building your deck out of, it is time to start your project. Permanent structures like decks require supports and footings that are made from solid concrete. Make sure to check your local codes as factors such as a minimum diameter and minimum depth of footings are critical in making a decision during this process. Footings must also be set below the frost line in order to prevent any movement through yearly freeze-thaw weather cycles. Following are two deck foundation options to consider. The classic deck footing method to is to dig post holes, pour in some gravel, place in the deck's structural post, and then pour concrete around the post to keep it in place. This method is relatively inexpensive and will get the job done. There is a lot of time and work that goes into digging post holes and pouring concrete. The holes must be dug past the frost line, meaning that heavy machinery (like a power auger) may be needed. All the work involved in mixing, setting, and waiting for the concrete to cure can be a process that lasts days. Even after all of this work is done and your deck has a solid foundation, there is still a chance that your deck will suffer from frost heave. Shifts resulting from ground freezing and thawing can create an uneven deck surface, which is unsightly and can be dangerous. Why use the traditional concrete deck foundation method? The classic concrete and post method is a tried and true foundation option. It is widely used and well understood by experienced deck builders. Despite being the default construction method, it is important that you understand the potential second-order effects - such as the costs needed to repair the damage created by using excavation equipment - before moving forward. The Diamond Pier foundation system is a precast concrete block with holes that lock in four weight-bearing galvanized steel pins. These pins drive into the ground at a 45-degree angle, transferring the deck load to a larger area of undisturbed soil than traditional concrete footings. Compared to the traditional concrete method, Diamond Piers require much less work and time to install. There is no digging, pins take minutes to drive in, and no days are wasted letting concrete cure or waiting for hole inspection (Diamond Piers are code compliant out of the box). The Diamond Pier system is also proven to perform as well as or better than properly installed traditional footings. They provide superior performance in conditions where frost is present and come with a lifetime warranty. Using the Diamond Pier Foundation System over traditional methods can be more expensive. However, the initial costs are mitigated by the absence of post-project repairs need to remedy excavation damage. It is also possible to still experience some frost heave. Why use Diamond Pier deck footings? Overall, the Diamond Pier system is the easiest and most efficient method for installing deck foundations. It does not require any heavy machinery or waiting for a certified installer, two hidden costs that are often overlooked during the planning process. 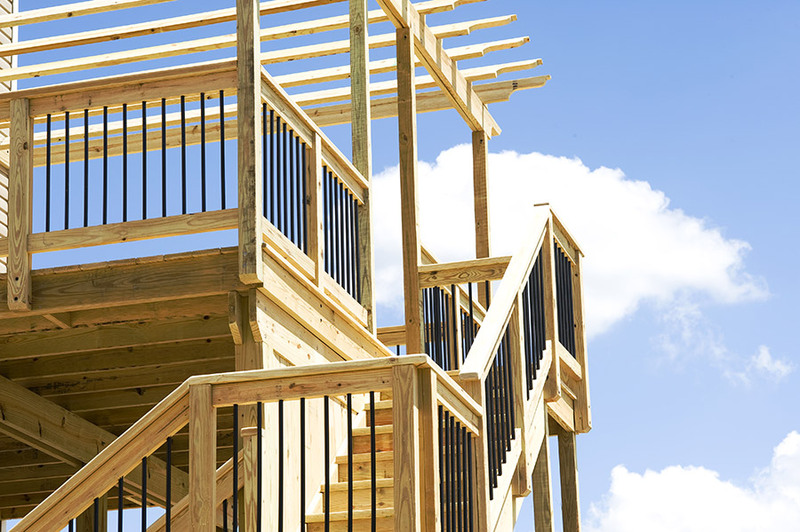 A deck frame is the backbone of any deck. While code compliance is of the utmost importance, longevity and use cases also need to be considered. Pressure treated lumber is the most common deck framing option. As noted above, it is wood, often pine, that has been treated with chemicals to repel insects and moisture. 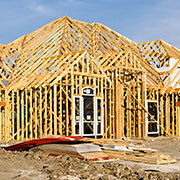 Pressure treated lumber provides a mix of affordability and durability that many homeowners find attractive. The product is also widely used, meaning most deck builders will have experience working with the material. 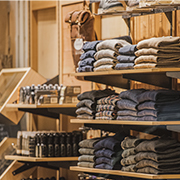 Pressure treated lumber is prone to issues that plague wood - warping, shrinking, splitting, cracking, and twisting. These issues are compounded when it is used as a frame for composite decking as these materials have less holding power than traditional wood decking. Why use pressure treated lumber for deck framing? Pressure treated lumber is a great deck framing option for small decks and jobs where cost is a key concern. However, the risks inherent to using any wood product should be considered - especially for composite decks. Although steel is not a new material, it's use as a mainstream deck framing option is. Steel framing for decks is light-gauge steel that is very similar to what is used for wall studs in commercial properties. Its dimensions are approximately the same as lumber, but it is much stronger. Unlike pressure treated lumber, steel framing is dimensionally stable. It does not absorb water, dry out, split, shrink, or warp. It is lighter and stronger than wood, allowing for longer spans, fewer posts, and less obstructed views. Steel framing is more costly than wood. Despite its superior durability, if there is damage during installation the needed repairs or replacement can be expensive. Why use steel deck framing? Steel has significant advantages over pressure-treated lumber. When properly installed it will greatly outlast a wooden frame. For medium to large projects or those using composite deck boards, steel is recommended as it makes for a deck that can survive almost anything. As the demand for outdoor living spaces continues to grow, so do the opportunities for customizing the space to make it your own. Deck railing is the most outwardly visible component of any deck. Whereas wood once reigned supreme, the most polished decks are now outfitted with composite and/or aluminum railing. 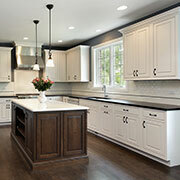 These products provide a range of colors, finishes, and styles in an easily configurable and low maintenance package. Amerhart carries two lines of composite railing: Trex and RDI. Both offer railing packages to meet your budget and match your style, with accessories like gates and ADA handrails available for added customization. Structural wood screws. FastenMaster's LOK Line features framing, ledger to rim joist, heavy duty, through-bolt replacement fastening options for nearly every application. Fascia systems. Composite and PVC deck fascia boards expand and contract with changes in temperature. A deck fascia system - like the Deckfast® Fascia System from Starborn Industries - utilizes a pre-drilling tool to create an oversized hole for the fascia screw so that the fascia board hangs from the screw and can expand and contract without putting a large amount of force on the fastener. Deck and trim screws. Traditional deck screws for composite, PVC, and wood decking (available to match colors from select brands). Check out FastenMaster's TrapEase3 AutoFeed Composite Deck Screws for an efficient composite deck fastening system. Hidden fastening and hidden deck clip systems. 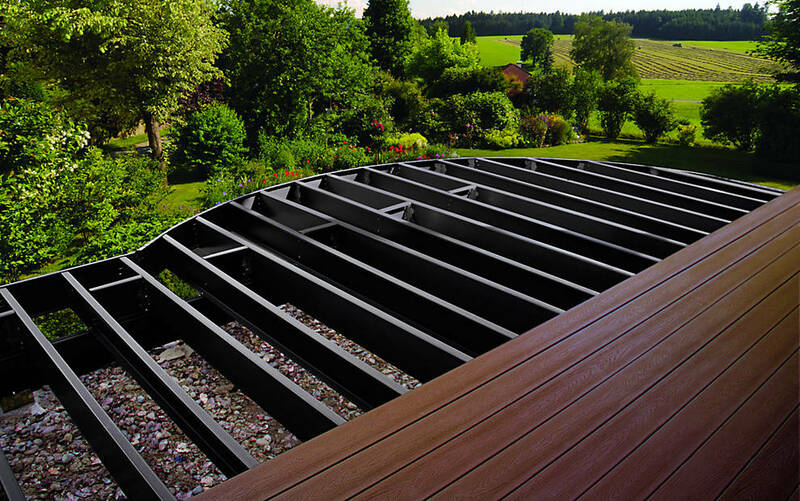 Available for select brands of composite decking, these systems provide the same level of structural integrity as traditional screws with the added benefit of being nearly invisible. In addition to being more aesthetically pleasing, using hidden fastening systems avoids potential snags that could be caused by traditional screws. With the right light, you can take any outdoor space from invisible to inviting. 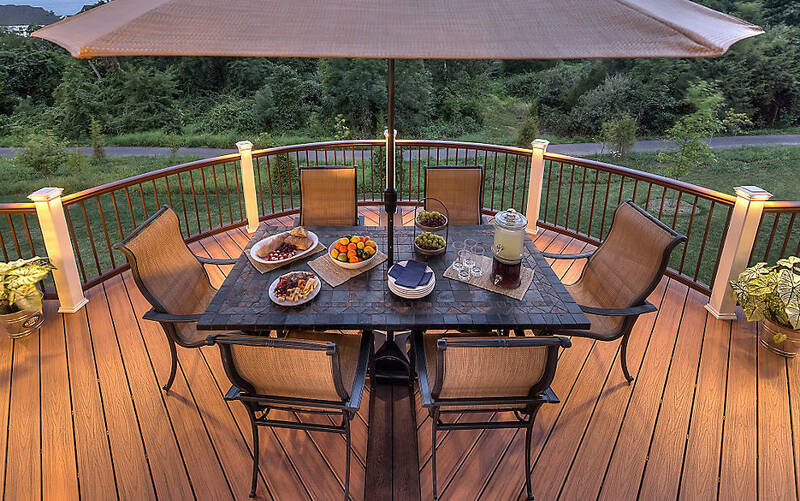 LED deck lighting from Trex adds energy-efficient nighttime safety and ambiance to your outdoor space. Post cap, deck rail, stair riser, and recessed deck lights are the perfect complement to your composite deck. Amerhart's custom fabrication division specializes in creating unique deck designs. From custom inlays to curved decking and railing, we've got the equipment and expertise needed to set your outdoor space apart.